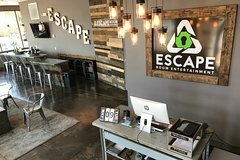 Inspired by the escape room craze sweeping the globe, ‘Escape Room Entertainment’ is the ultimate facility of its kind. We offer various exciting games set in a physical location that will test your intellect and ability to work efficiently as a team. From the moment you walk in the door you’re immersed into the world of ‘Escape’. You and your team choose your mission; do you want to solve a murder, board a pirate ship on the high seas or enter a forgotten temple to uncover an ancient artifact. The choice is up to you, but whatever you choose you must work as a team to complete the task at hand. As you navigate around your new world, you will encounter various clues and puzzles that will immerse you further into the game. Can you decipher all the riddles and crack all the codes that lead to your team’s escape? Only time will tell… and the clock is ticking. While immersed in the world of your choice you will search for clues, solve puzzles unlock locks. Each clue you solve and each puzzle you complete along with every lock you unlock takes you one step closer to solving the entire mystery of the room and getting you to escape. Each room has a different story with different clues and puzzles for you to discover and to solve. Work together as a team helping each other uncover the clues and solve the puzzles to finish your quest. Unite your team and become victorious! Do you have what it takes to escape?